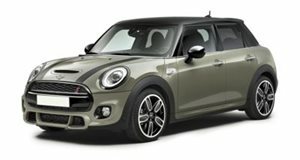 According to AutoExpress, these are the official photos of the planned production version of the MINI Rocketman concept. But just to make everything 100 percent clear: they&apos;re not. AutoExpress is known to be sort of the sensational British auto tabloid and these photos are simply photoshop work done to image of the concept car that debuted at Geneva last March. Fortunately, AutoExpress does confirm that the Rocketman will be built. MINI has been looking to build a city car for some time now and with the upcoming BMW i3, there&apos;s been talk that BMW will share the carbon fiber and aluminum chassis with MINI. That seems unlikely, however. Reason being is that the i3&apos;s components are expensive to manufacture and MINI wants the Rocketman to be priced lower than the standard hatch. Early indicators suggest the i3 will start at around $40,000 - way out too much for an even smaller MINI. More than likely, the Rocketman will be based off a shortened version of the existing MINI chassis.